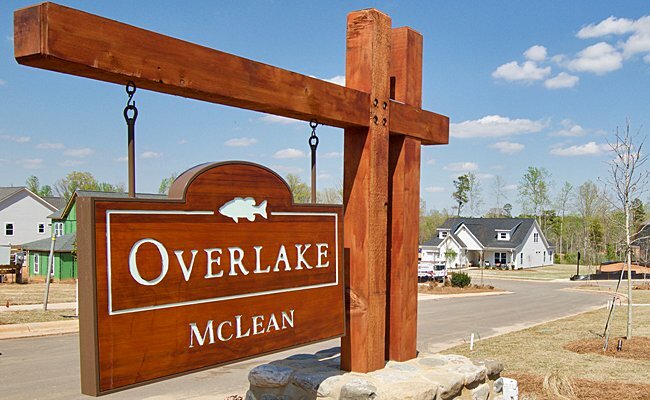 Traditional single-family homes in one of region’s most desirable small towns – that’s the winning formula for good living in McLean’s new Overlake neighborhood. 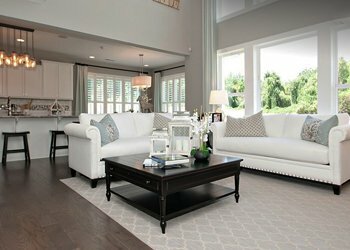 Overlake’s builders, Shea Homes and Evans Coghill Homes, have furnished model homes near the Overlake entrance on South New Hope Road, Belmont. Historic downtown Belmont has numerous restaurants and boutiques. Located near Daniel Stowe Botanical Garden, Overlake offers quiet residential streets, a neighborhood pool and easy access to community trails, waterfront and recreational areas. 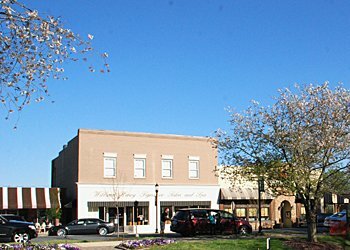 Belmont’s vibrant and historic village center, rich with restaurants, pubs and boutiques, is just a few minutes away. Both Evans Coghill and Shea have homes under construction that will be available for quick move-in by early autumn. Visit the Overlake Photo Gallery for a visual tour now. Shea Homes’ Calista plan features a two-story window wall. Among Shea homes nearing completion is the popular Calistoga design at 2021 Rockbrook Lane. The home features formal dining and living rooms, owner’s suite with two walk-in closets and a two-story family room with soaring window wall and gas fireplace. The Calistoga is available in several styles starting at $304,400. Learn more and take a virtual tour of this home. Explore other Shea homes available in Overlake. The Evans Coghill model has a spacious kitchen for cooking and snacking. Evans Coghill Homes, a Charlotte-based builder, offers feature-rich and flexible designs starting in the mid $300s. The builder’s model home at 1000 Overlake Drive provides 3,000 sf of well-crafted space in a master-down 1 1/2 story layout. This new design caters to those who are looking to downsize, as well as to younger buyers yearning for an open, family friendly yet luxurious home. Evans Coghill has just published a brochure about its homes in Overlake. View it here. 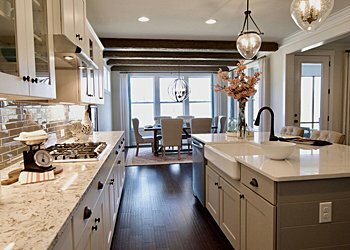 Learn more about Evans Coghill homes at Overlake. 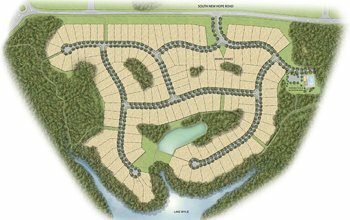 Overlake includes a pond and natural area, swimming pool with playground and several home sites overlooking a Lake Wylie cove. The entrance to Overlake is located on South New Hope Road, Belmont, just north of the Armstrong Road roundabout. Directions.